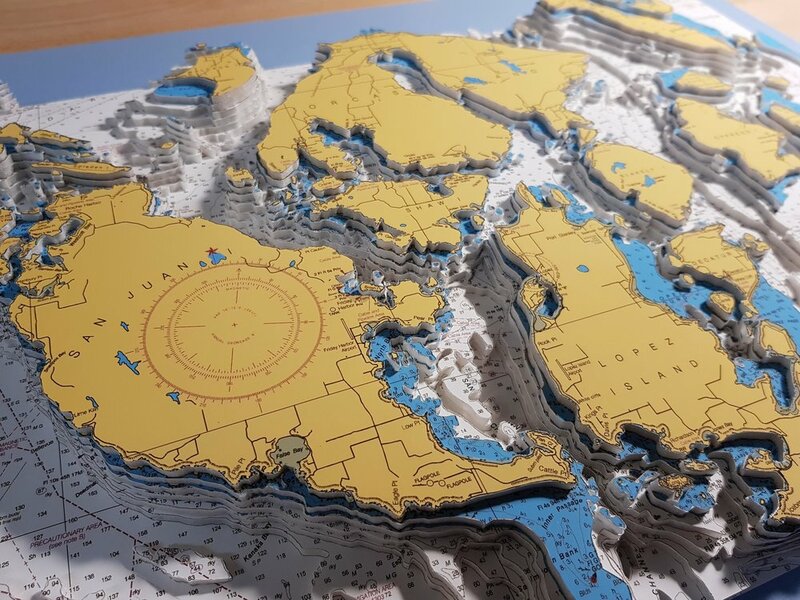 I produce beautifully handcrafted 3D nautical charts and historic maps. My artwork brings the areas to life and creates a spectacular display piece in any room or yacht. Each piece is individually crafted and hand cut into as many as twelve 3D topographical layers. The work is then carefully framed for display, with optional lighting, bringing a fresh perspective on what lies beneath. If there's a special place for you and your loved ones, contact me to bring it to life in a stunning and unique way! Commissioning your own 3D nautical chart or historic map couldn't be easier! Contact me with your desired location, or view my previous work below for inspiration. Made in the San Francisco Bay Area, I deliver within the USA and internationally. 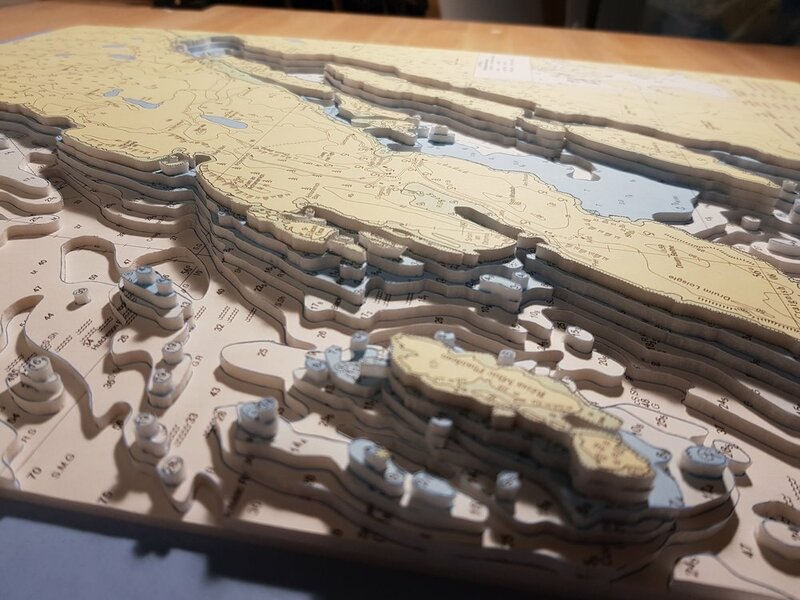 I hand craft 3D nautical charts from anywhere around the world and transform them into unique pieces of art that are sure to be the subject of conversation anywhere they're displayed. My artwork is of the highest quality and professionally framed with optional lighting. "Traditional yet unique" - I bring to life beautiful old masterpieces with a new 3D perspective. This is an ideal gift for people who love maps and history. I have hundreds of historic maps to choose from; just contact me with your area of interest. My artwork includes a custom made frame with optional lighting. Check out the below links for recent press on Neptune Maps and our 3D nautical charts! This is one of my favorite charts! So much depth and detail. NOAA chart of the San Juan, Orcas, Lopez and Fidalgo islands. 8 layers deep displayed in a brown custom made Italian walnut frame 24" x 20"
Absolutely spectacular piece commissioned as a gift for the owners of a Hollywood star's home, once owned by Kim Novak on the Big Sur coast. This is a 9 layer NOAA chart focusing on Carmel, Point Lobos and Yankee Point. NOAA chart of Hawaii makes a fantastic 3D nautical chart, this particular piece has 8 layers and I am so happy how it turned out! Frame: Signature Collection 24" x 20"
A wonderful 8 layer chart of Saint-Tropez, commissioned by a dear friend of mine as a surprise Christmas gift. The chart focuses on the Golfe de St Tropez and the family villa in Gassin. 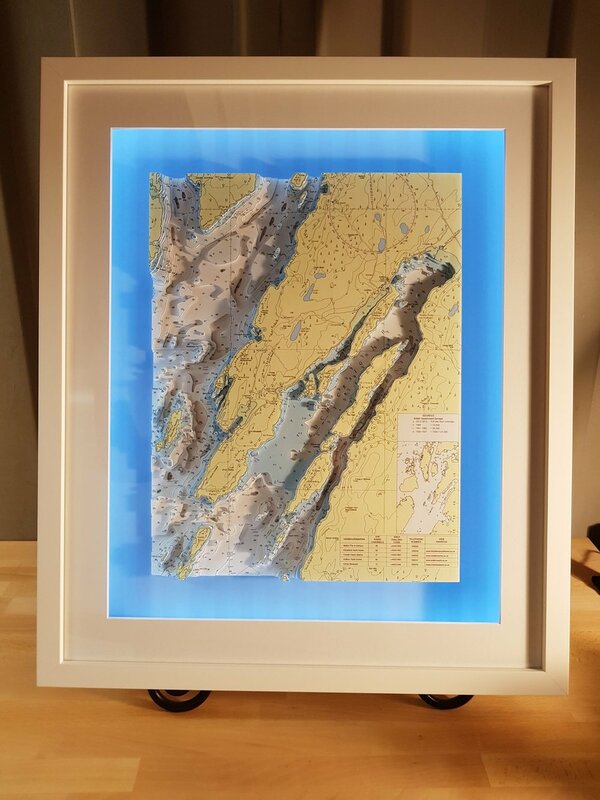 Framed as the "Perfect size" collection 20" x 16"
This is a whole 3D nautical chart of the Virgin Islands, I used a NOAA chart of Virgin Gorda to St. Thomas. This absolutely beautiful piece is 7 layers, focusing on both US and British Virgin Islands. Frame size 38" x 24"
San Francisco Bay Leukemia Regatta commissioned this wonderful piece to be auctioned at the Corinthian Yacht Club at the Regatta Gala dinner. 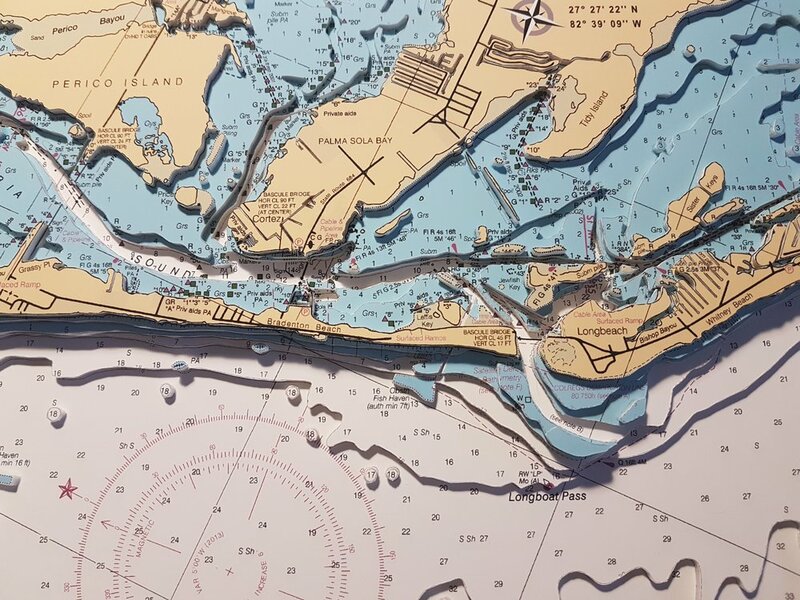 Amazing in size and detail, this 8 layer 3D nautical chart of the San Francisco Entrance and the North Bay is truly a great artwork. 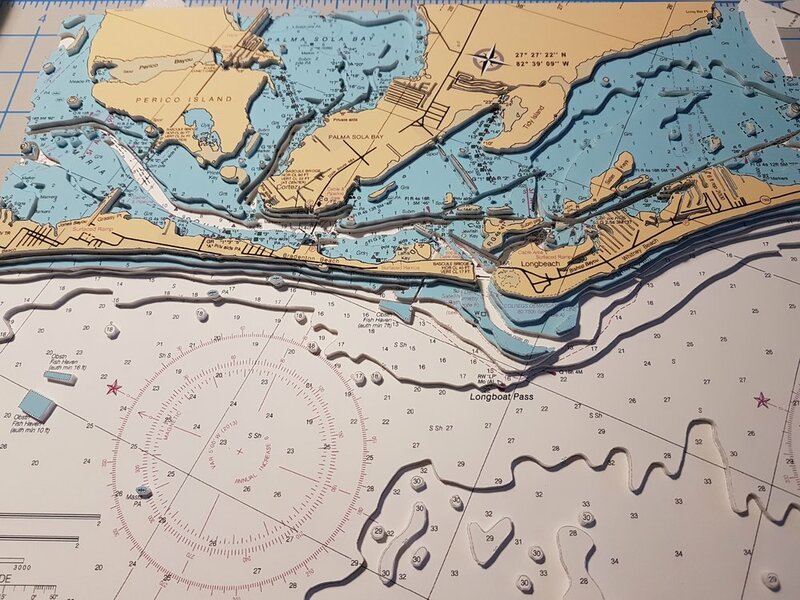 I really enjoyed working on this piece, 8 layer 3D nautical chart of the southern part of Puget Sound and Tacoma. 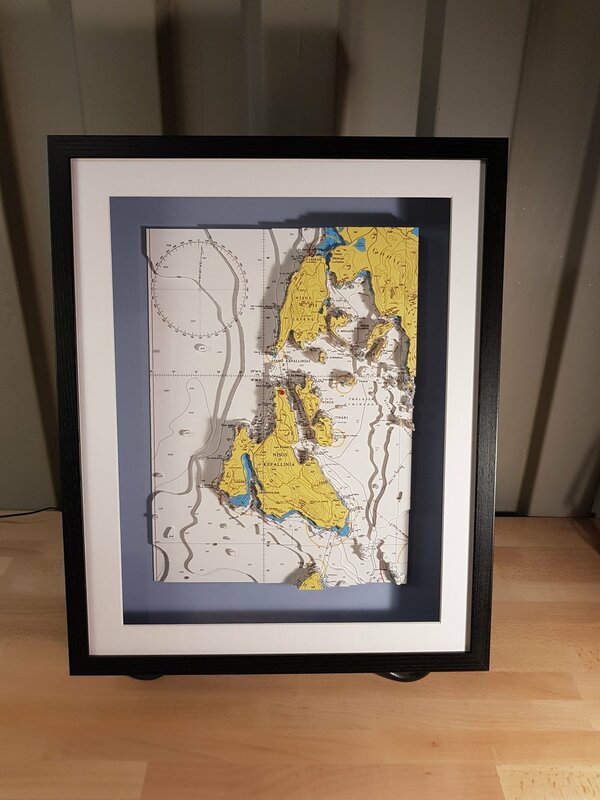 Frame: Signature collection, Natural Walnut 24" x 20"
Very dramatic 3D nautical chart of Denmark and part of Sweden. 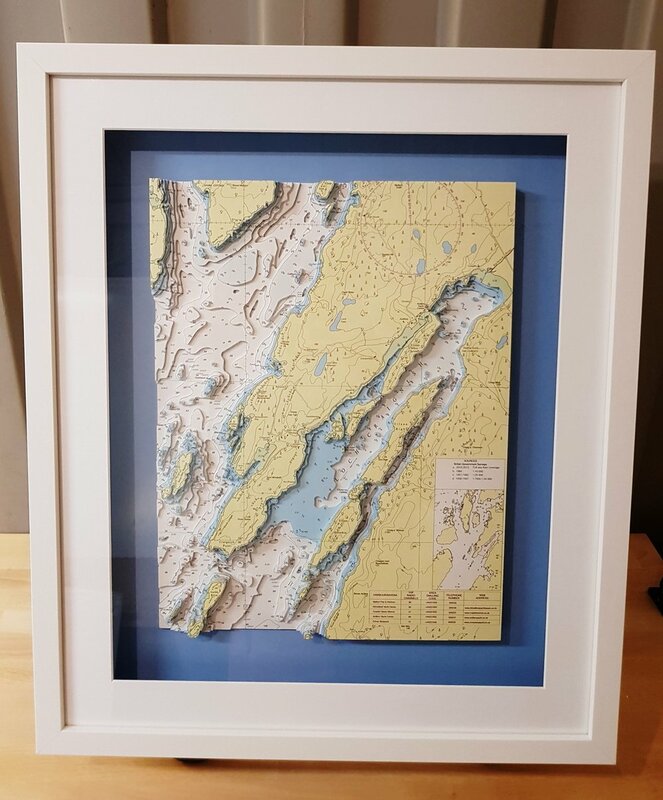 Signature Collection frame 24" x 20"
This 8 layers NOAA chart of Lake Tahoe was commissioned as a wedding gift. Beautifully framed in natural walnut wooden frame. Frame size 24" x 20"
My client Nick commissioned this piece as a gift for his son's graduation. Congratulations Alex. Framed in Perfect Size collection 20" x 16"
With LED lighting and UV conservation glass. Great 3D nautical chart of New York Harbor, also featuring Manhattan, New Jersey, Brooklyn and Queens. Framed in custom made Natural Walnut 16” x 16” in size with UV protected glass. Beautiful chart of the Greek coastline commissioned as a vacation memorabilia. Frame black wood - 20" x 16" with LED lighting. I really enjoyed working on this piece, in September 2018 my spouse and I will be sailing from San Francisco to those wonderful islands for 4 weeks vacation. One of my favourite charts so far, this is a 9 layer NOAA chart of the Hawaiian Islands. It looks so spectacular. Spectacular large piece of Bermuda Islands. This is a very complex chart and one of the most difficult I have ever done, the result is absolutely stunning. This artwork proved very popular on the island and I have now made another 3 pieces. 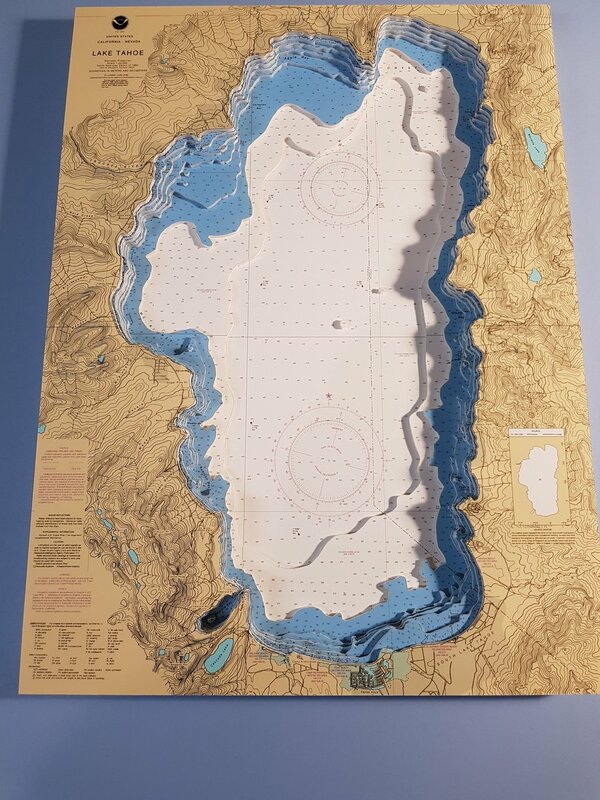 Wonderful 7 layers 3D nautical chart of the Scottish coastline focusing on Loch Craignish. This piece was commissioned as a suprise gift for Mike's 50th birthday. Mike and Susanne kept their yacht in Loch Craignish, so these waters have a special place in their hearts. 7 layers NOAA nautical chart of the Galveston Bay Entrance. 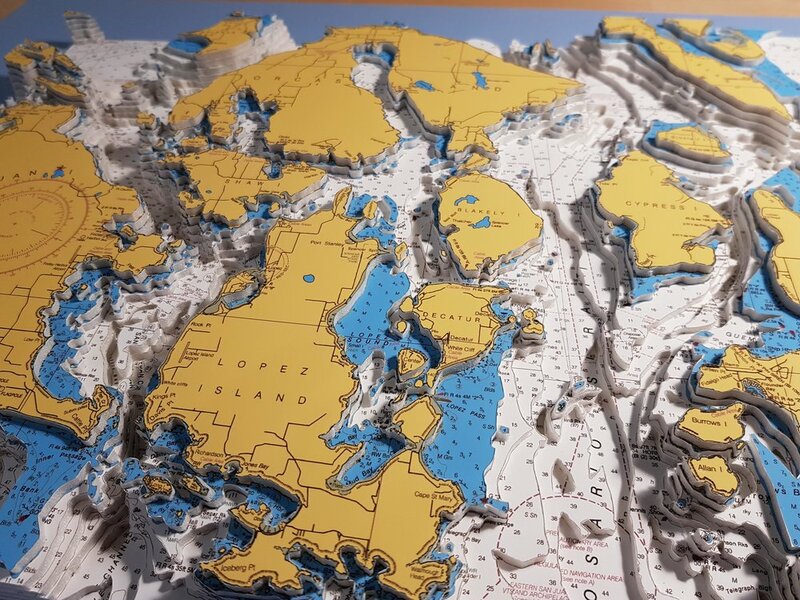 Fantastic 3D nautical chart of the Aegean Sea, Greek islands and Turkish coastline. This was commissioned for a sailor's 60th birthday as a suprise gift by his children. 10 layer NOAA 3D nautical chart of the Monterey Bay in California. 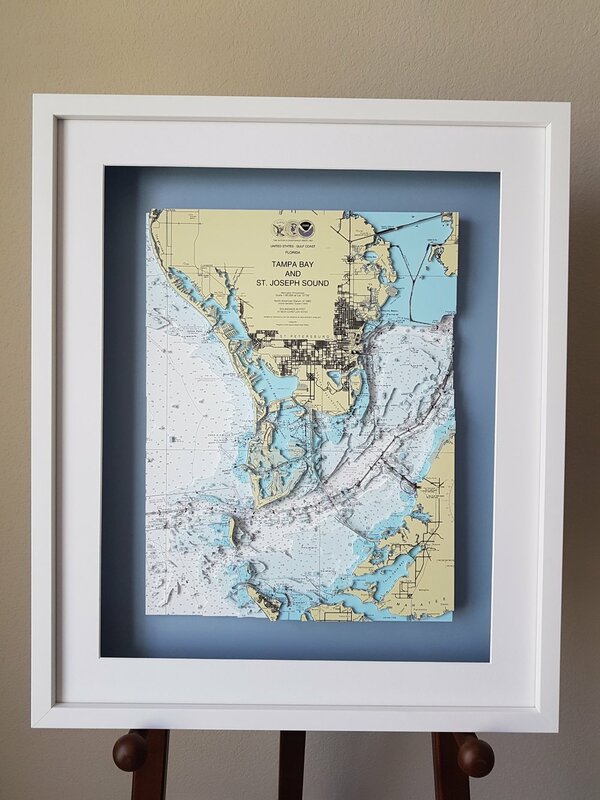 Artwork size 17" x 13"
3D nautical chart of the Tampa Bay and St. Joseph Sound. This is a really complex piece due to the detail of the chart, totally worth the effort though. NOAA chart of the area crafted into 6 layers. 3D nautical chart of Clayton to False Ducks Island featuring the eastern part of Lake Ontario. This particular chart marks the clients lakeside property and will make a wonderful surprise gift for Christmas. 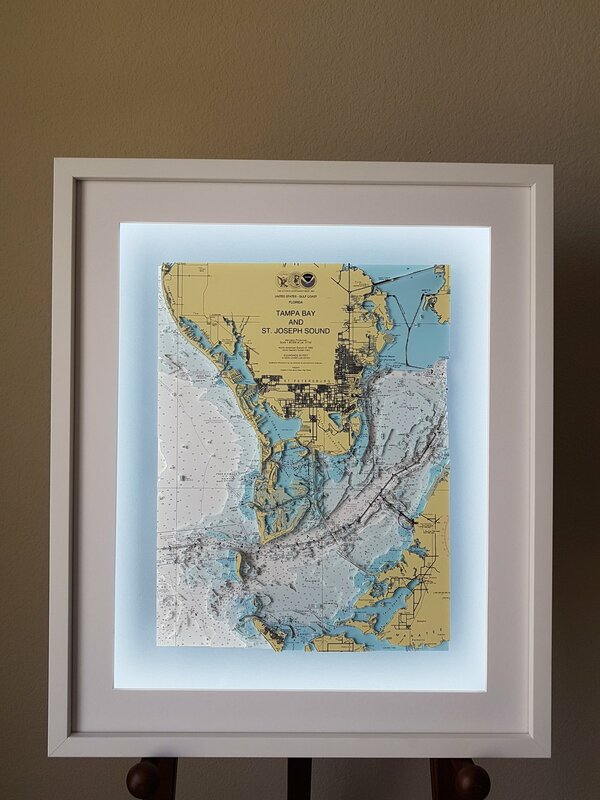 Frame: Captain's Collection 14" x 11"
3D nautical chart of Sarasota Bay, this is a 7 layers chart focusing on Brandenton. This was commissioned as a surprise gift from my client to his wife to celebrate their new house. 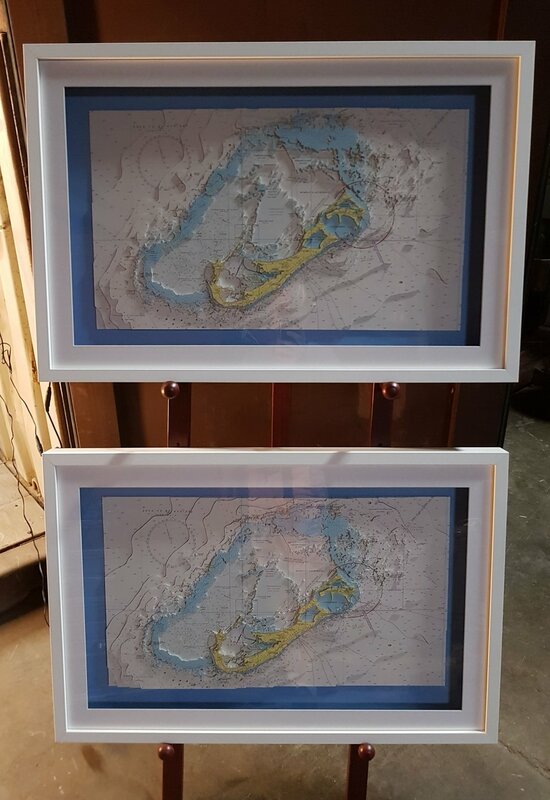 This 3D nautical chart of the Big Island in Hawaii was commissioned while exhibiting at the San Francisco boat show. This is a beautifully crafted 10 layers NOAA nautical chart. Custom framed with LED lights. Frame size 21" x 20"
This is a stunning section of the Virgin Islands focusing on Tortola and St. John's islands. I produced this 7 layer 3D nautical chart using a NOAA chart of the area. This 7 layer 3D NOAA nautical chart of the Bahamas focuses on the Grand Bahama and Great Abaco Islands. NOAA chart of San Francisco Entrance, this 7 piece layer focuses on capturing all 3 bridges. Golden Gate, Bay Bridge and Richmond bridge. This artwork was commissioned for a client who lives onboard his yacht in Richmond Marina. 7 Layer nautical chart of the Sandy Haven Bay in Wales- United Kingdom. This artwork was commissioned by a client in Geneva as a gift to her partner who use to sail in the area. Great NOAA chart of the Delta- Featuring Martinez bridge, Antioch and Pittsburg. This is a 7 layer 3D nautical chart. NOAA nautical chart of Santa Catalina, one of the Channel Islands, California. I was commissioned to complete this beautiful piece as a gift for a sailor in the area. This chart consists of 9 different layers creating a fantastic display piece. Frame size: 20 "x 16"
I have been commissioned to produce the San Francisco Bay several times and really enjoy crafting this piece on each occasion. It remains my most popular chart - a true classic! This NOAA nautical chart has 7 3D layers and includes San Francisco City, Marin County, Angel Island, Alcatraz and the East Bay. Large Admiralty chart of Malta and Gozo. Two fantastic islands in the heart of Mediterranean sea. This artwork has shipped to a client in Malta and measure 27" x 20"
Will be framed by the client. One of my most popular piece. This is a medium size NOAA chart of the San Francisco Entrance focusing on the City, Sauselito and both Golden Gate and the Bay Bridge. Oahu is a U.S. island in the Central Pacific, part of the Hawaiian island chain and home to the state capital, Honolulu. This features 6 3D layers of the NOAA nautical chart of Oahu. 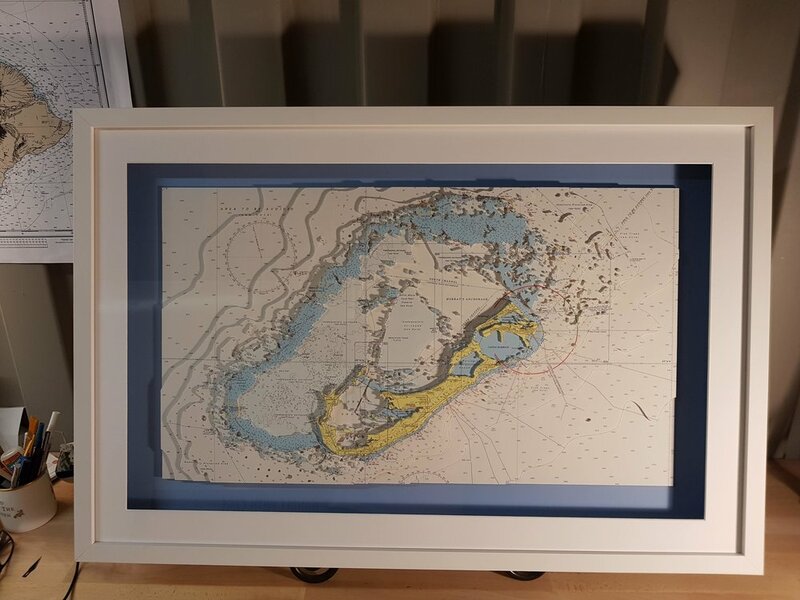 Frame size: 20" x 16"
Nautical chart of Hong Hong Island and Lama Island. 5 layer chart, artwork size 12" x 12"
Frame size 16" x 16"
This 6 layer historic map of New York and Brooklyn from 1850 is one of my most popular commissions on the East Coast and certainly one of my favorites! 6 layer map of Sicily and Malta from between 1730-1760. Shown with and without lighting. This 5 layer historic map of Venice from 1729 really brings the city to life, showing the Grand Canal in exquisite detail! Contact me to commission your own piece.